Abner "Longie" Zwillman grew up in Newark, New Jersey in the early 20th Century. Although his origins were humble (and bringing his name up to most people will produce a puzzled stare), he went on to become the "Al Capone" of New Jersey. Zwillman went to work at an early age to support his family after he was forced to quit school after his father died. It was said that his nickname came about as a result of both his above average height (6'2) and fearsome reputation. As the story goes, when the Jewish pushcart peddlers were harassed by neighborhood anti-semites someone would yell "Get der langer!' literally "the long one." Thus at an early age "Longie" developed the reputation as a defender, but eventually also that of a major gangster. He soon got involved in numbers running and other forms of racketeering and with the advent of prohibition, like almost all of his colleagues, he found himself running and distributing alcohol. At this time, the headquarters for his operation were in Newark's Third Ward. Partnering with Joseph Reinfeld to smuggle and distribute liquor in from Canada, it was estimated that his earnings during prohibition averaged two million dollars a year and he became an equal and colleague to the likes of Meyer Lansky, "Bugsy" Siegel, "Lucky" Luciano, Frank Costello, "Lepke" Buchalter and "Dutch" Schultz. He was also said to have been a member of "The Commission" or "Big Six" or whatever name you would prefer to call the top echelon of the combination of Italians and Jews who ran organized crime during this era. In 1938 Zwillman was interviewed by the FBI investigating the whereabouts of the still in-hiding Lepke Buchalter. The memorandum still exists where he gives a fascinating accounting of all the gangsters of his day that he knew or rubbed shoulders with. He talks about everyone from "Trigger Mike" Coppola, Joe Adonis and Frank Costello to the infamous Verne Miller of the Kansas City Massacre. Many don't know this but when Verne Miller went on the run for his role in the massacre, Zwillman supposedly hid him for a time. Talk about two world's colliding. You can read the entire FBI memorandum here, but the interview starts on p. 24. 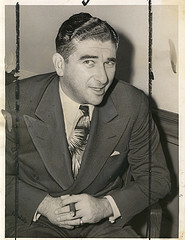 Zwillman along with his partner Willie Moretti, dominated gambling operations in Northern New Jersey. Particularly in the Fort Lee area where they ran The Riveria nightclub just off the George Washington Bridge. He gained tremendous political power as well sponsoring and backing a number of Newark politicians along with various NJ statewide elected politicians. During the height of the Lindbergh kidnapping hunt, Zwillman offered a hefty sum as a reward leading to the kidnapper. He was said to have dated the actress Jean Harlow for a period but ultimately married Mary de Groot Mendels Steinbach in 1939, whose father was a founder of the American Stock Exchange. They remained married for the rest of his life. The had one daughter Kathryn in 1944. 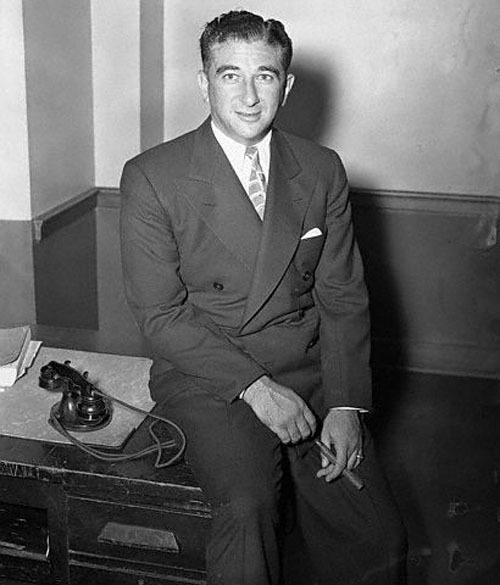 According the the testimony of Murder, Inc. turncoats Abe Reles and "Tic Toc" Tannenbaum, also in 1939 on a stop over from NYC to NJ on the way to the mob hit of Harry Greenberg (Bugsy Siegel, Frankie Carbo and Tannenbaum were suspected but never convicted of the hit), Zwillman provided the weapons that were used in the murder. The 1950s were tough for Zwillman. He was forced to testify in front of the televised Kefauver Commission hearings in 1951 where he claimed despite being a bootlegger during prohibition that he had gone completely straight. Soon after the hearings his friend and long time partner Willie Moretti was assassinated at Joe's Elbow Room in Cliffside Park, NJ, supposedly because he had lost his mind and was "talking too much." Also during the 1950s, The IRS relentlessly hammered away at him. Although, in 1956 a jury deadlocked on tax evasion charges and the case was dismissed. On February 17, 1959, "Longie" was found hanging from a ceiling rafter in the basement of his West Orange, NJ home at 50 Beverly Road. [Editors note: You can still see the house, but it's on a semi private road so be careful.] As with all premature organized crime deaths, there is fierce speculation as to whether it was suicide or a mob hit. Some say the pressures, including a pending appearance at the McClellan Senate Committee on organized crime and the IRS heat got to him, others say he took the wrong side of a mafia conflict to do with Carlo Gambino, Lucky Luciano and Vito Genovese. Not many people left who can fill us in. He was only ever convicted of one crime, assault, in 1929 for which he served six months. Owned large numbers of industrial establishments, hotels, restaurants and was a big player in the cigarette vending machine business. As big time gangsters love to do whether for PR or out of true altruism, he funded several Newark area soup kitchens in the Depression era and provided needy Jews with food baskets during Jewish holidays as well as Christians with food and gifts during their holidays. Meyer, Daniel. "Abner "Longie" Zwillman - Gangster." J-Grit: The Internet Index of Tough Jews. J-Grit.com. Apr. 2019 <http://www.j-grit.com>.